Ok so I bought a Brakeout 5.56 to mount an AAC SDN6 i have in the works. I bought it from Core15 because they had some in and these seem to be hard to find. Got the mount timed correctly finally and I'm now worried about the clearance. I read 1000 post about the DDMK18 uppers which appears to have even less space, half the people say it will not work other post pics of it working. I contacted AAC to try and get actual measurements of the space required behind the teeth but they did not give me an actual measurement. they also did not tell me how much i would gain with the newer mount with the wrench flats, I've heard you gain some i'v heard the barrel recesses into that area and you don't gain much. I also contacted PWS and i'm still waiting for a reply. Ok I found and ordered a newer style BRAKEOUT with the wrench flats. I read all sorts of post about how much it add does the barrel recess into the wrench flat section etc. I took some careful measurements and compared both styles. On the wrench flat section the barrel does recess into the mount. It only ~ 1/16". The overall additional space you gain behind the teeth with the newer mount is ~1/8"
This little extra will ensure I have clearance without using a bunch of shims. It will fit! I have the MK109 300blk upper with the sdn6 and it clears the top rail. You need something to depress the latch when you remove the can but it has a nice tight fit when mounted. Actually I was not concerned about the top rail. I was concerned about the space between the back of the can and all the other rails. Basically I'm concerned it will screw all the way on before hitting the front of the rails. did yours come with a shim behind the PWS muzzle device? 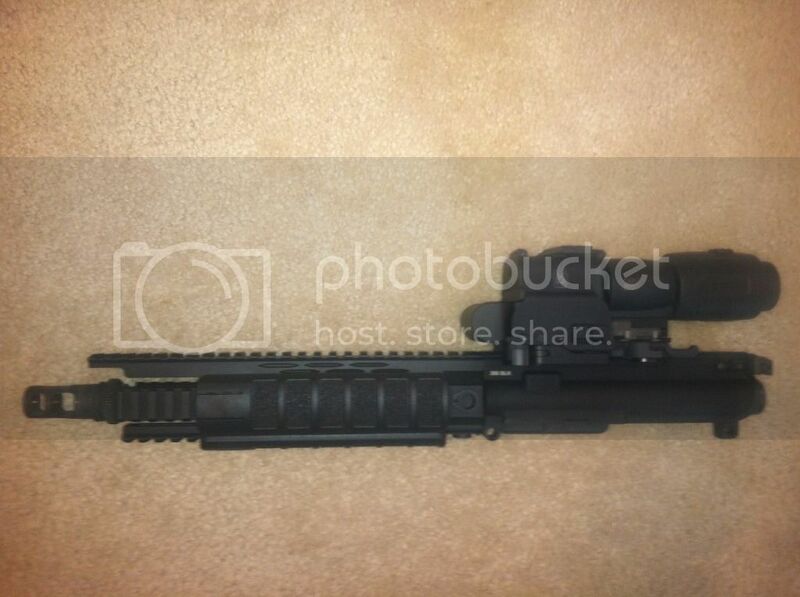 i used the factory shim on the barrel and then like one of the timing shims from AAC and it works perfectly. My MK110 came with the PWS Triad flash hider. It had several VERY thin shims. I used only the AAC shims I needed to time the BRAKEOUT correctly. That pic is perfect. The worst case scenario is I need to add a few more shims and re-time the BRAKEOUT. What muzzle device came on your PWS? How thick was the shim? Mine came with the Triad flash hider as well. 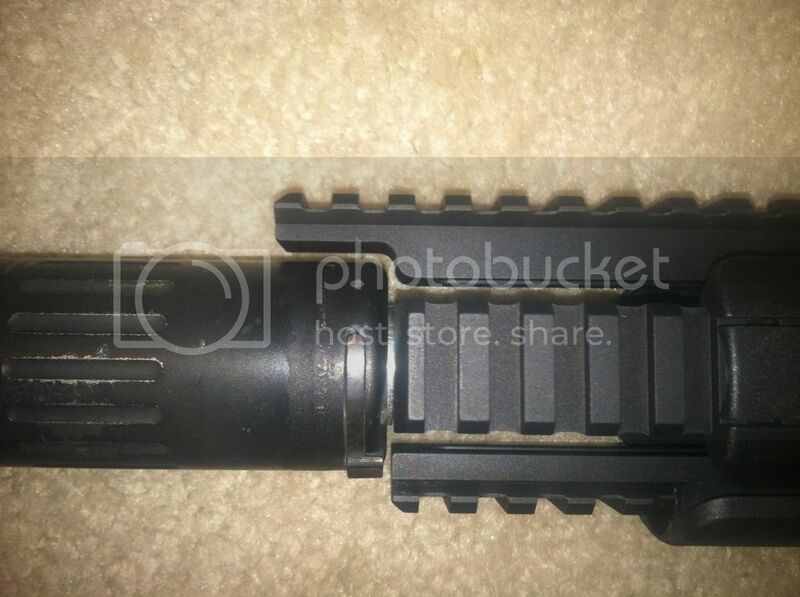 Maybe because its the 308 flash hider (5/8x24) version it came with a thicker washer. It is about 1/16-1/8" Im guessing, I didnt measure it. In the picture you can see the washer . Here is another pic but unfortunately its not a close up.